Vitamins & MineralsScitec Multi-Pro Plus - 30 sasz. Scitec Multi-Pro Plus - 30 sasz. Incredibly effective preparation vitamin-mineral, in which the doses of the individual substances were selected to cover the entire demand! The addition of omega lecithin and further enrich the composition! Scitec Multi Pro Plus is designed for you - if you're serious about training and expect a lot from their diet in your plan supplementation may be missing Multi Pro. The preparation Scitec Multi Pro Plus includes a laboratory-developed and quantitatively selected organic composition of vitamins, minerals and trace elements. The preparation is a stimulator of many key metabolic processes to strengthen the vitality of man. It was prepared to support the body during periods of intensive physical and mental. Thanks to the large concentration of antioxidants fights dangerous to the health of free radicals, which greatly increases the body's resistance. Scitec Multi Pro Plus is an excellent dietary supplement for all professional athletes and recreational athletes during the period of deficiency of vitamins and minerals due to training, uniform nutrition or diet reduction. 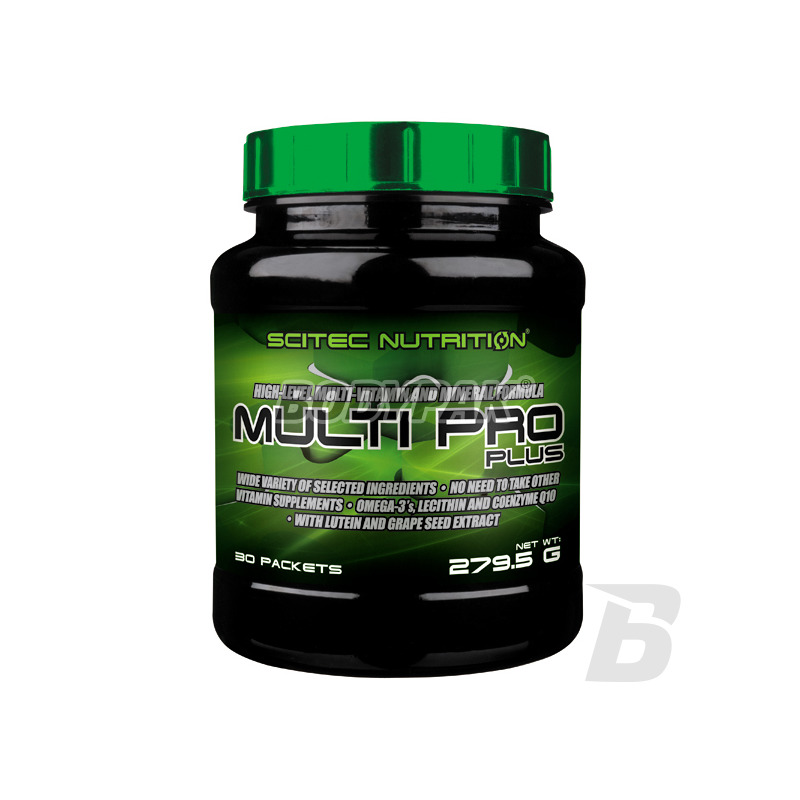 Scitec Multi Pro Plus is an excellent supplement that increases the body strength, improves processes of supply of energy and helps digestion and assimilation of nutrients, such as: carbohydrates, proteins and fats. Vitamin C, and essential minerals, including magnesium, selenium and zinc. Vitamin C contributes to the proper functioning of the immune system and the nervous system, reduces fatigue and weariness. As well as it helps to maintain the normal functioning of the immune system during and Interestingly, during intense exercise (this effect is observed in the provision of an additional 200 mg of Vitamin C than the recommended daily intake). Vitamin B2 helps to maintain normal vision also helps to maintain the proper condition of red blood cells. Folic acid helps in the proper amino acid synthesis. MULTI PRO PLUS is 250% of the recommended daily intake of Vitamin D3! Vitamin D3 contributes to the proper functioning of the immune system and muscles as well as the normal absorption (absorption) and utilization of calcium and phosphorus. Zinc contributes to the maintenance of normal levels of fertility and reproductive capacity, and to maintain a normal level of testosterone in the blood, as well as the normal metabolism of macronutrients. MULTI PRO PLUS is additionally Omega-3 and Lecithin Softgel, Coenzyme Q10, grape seed extract enriched in polyphenols, lutein is also strengthened. 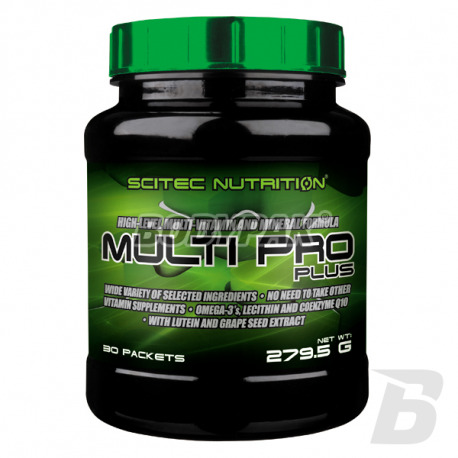 Scitec MULTI PRO PLUS - THE BEST SOURCE OF VITAMINS AND MINERALS FOR THE ATHLETE! 1 sachet (7 capsules) per day, preferably consumed during a meal. - Gel capsule with lecithin (brown capsule): soy lecithin, beef gelatine, humectant (glycerol), emulsifier soybean , water. Najlepsze witaminy i minerały jakie do tej pory stosowałem. Cena/jakość najlepsza na rynku !! Solidna dawka witamin i minerałów - produkt godny polecenia i warty swojej ceny! Potężne dawki witamin i minerałów. Nie ma konieczności stosowania codziennie jednej saszetki, więc biorąc jedną co drugi dzień wychodzi na 60 dni, także bardzo ekonomicznie. Olimp Chela-Mag B6 MAMA - 30 kaps. Chela-Mag B6 MAMA - is a dietary supplement containing magnesium in the form of amino acid chelate ALBION enriched with vitamin B6, cooperating with magnesium in metabolic processes. The product is intended for pregnant and breast-feeding, easy to cover daily intake of magnesium. Swanson Vitamin B12 500mcg - 100 kaps. High-quality vitamin B12 in the form of easy to swallow capsules. An ideal choice for people who are physically active and exposed to stress. Well digestible! Enough to pack as many as 100 full portion. Nutrend Multimineral Compressed - 60 kaps. Comprehensive preparation, so that will complete any possible shortcomings of the most important minerals! Absorption rate and the chosen dose to provide maximum support. High quality at a reasonable price!